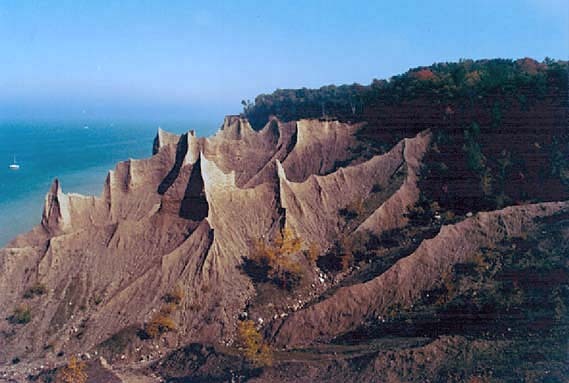 Chimney Bluffs is a lovely place to take an afternoon hike. It is a glacial moraine which has been eroded into a series of knife-edge fingers. You can start out walking beneath the bluffs on the pebble beach and stand on half-submerged rocks watching the waves wash over the sand and rounded stones. A mile's walk takes you under and around huge piles of driftwood and trees, which have become dislodged from the cliffs above and fallen half into the water. In the Spring, you can watch the mud ooze out of the bluff faces and drip down into little pools of tan-dyed water. In the Summer you can swim. On the way back, you follow the trail hugging the edge of the cliff up amid ferns, wildflowers and trees, reaching vista after vista, until you can see way out into the lake and watch the sky. In this piece, I do not attempt to depict the bluffs or a walk among them. Rather, after composing the work, I found that it awoke in me the clear but elusive calm wonder that I had experienced there in walks alone and with friends.